Stop guessing what box size you'll need...use adjustable height, multi-depth boxes instead. Meets all shipping requirements of UPS, FedEX, USPS and others. 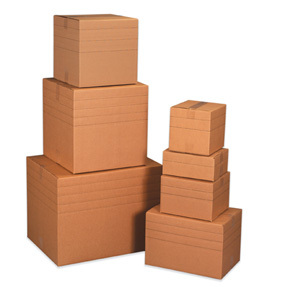 If you sell a lot of products, you might not be able to keep all the boxes you will need for all eventualities on hand. Or you might not want to have so many different sizes boxes available that you have a hard time finding the one you need. These adjustable height boxes can ensure that you fit any product without having to search for the right box and without having to keep your warehouse piled high with excess boxes. The boxes are scored so you can easily tell where each height is and are able to assemble it quickly. The sturdy corrugated boxes can stand up to 200 pounds of pressure, so you know they will keep your products safe all the way to their final destination. Browse our catalog by the range of lengths you need, and buy by the quantity, helping you to save money by buying more.